There has been plenty of big news since I posted at the beginning of the month. Grammy and Oscar nomination announcements, lineup announcements for the forthcoming Stagecoach and Coachella fests in Indio, and of course my trip to the NAMM show in Anaheim last weekend. I was only able to make it to make two days, for half a day on opening day, Thursday, Jan. 18, and then back for most of Saturday, Jan. 20. In addition to getting to see and check out some exciting new musical gear, I also got to meet a few musical legends including Brian Wilson (see lower photo). It was definitely surreal meeting the architect of so many amazing Beach Boys classics. 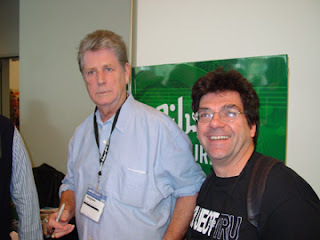 But the well-chronicled story of Brian's struggles played out before my eyes on Saturday afternoon where I waited in line at the Gibson booth to get an autograph and photo with the singer-songwriter. I said "Hello" and he kind of blankly responded. There were a number of photographers and autograph seekers circling like sharks, even cutting in front of those who had patiently waited for an hour or so in line. I will both fortunate and sad to have had this up-close encounter with an icon who seems to be spending part of his life in this world, and the other part in some far-off distant place. It was sad when some kind of handler/music rep thrust a guitar in front of him and asked him to sign it, treating him like a little boy and instructing him to "sign it clearly" that I found very offensive. After meeting Brian Wilson, I was off to catch the press conference where Duran Duran bassist John Taylor unveiled a new Peavey Liberator Series of instruments, including a bass guitar. Then he signed autographs and chatted with fans. I am a big fan of the band's most recent album, the wonderful "Astronaut," and had John sign a copy of that release (see top photo). The line to meet John Taylor was even longer than the line to meet Brian Wilson. 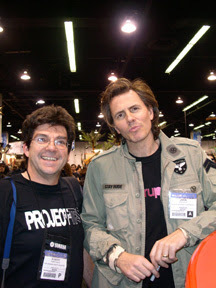 But that might have something to do with the John Taylor event being more heavily promoted and it being held in the main hall (whereas the Gibson booth was located upstairs and away from some of the main action). Other highlights of my trek to NAMM were getting to see fingerstyle guitarist Laurence Juber perform an acoustic set at Martin Guitar Booth on Thursday, and meeting guitar virtuoso Gary Hoey for the first time on Saturday afternoon. I will have a complete technical-styled look at NAMM published in the Orange County Register on Friday, January 26 and you might want to check that out. I had a blast checking out the new gear at Roland and saw some pretty amazing stuff at Yamaha Corp. of America too, including an 8-pad digital drum set that will be released in summer 2007. I'll report back tomorrow with thoughts on Coachella and other musical things. Orange County really knows how to party. Indeed, the return of Orange County New Year’s Eve – better known as OCNYE – provided area partygoers with plenty of options on Sunday (Dec. 31, 2006) night. They could spend their night in a VIP tent, watching the bright Orange Drop and fireworks at midnight, and celebrate while merely catching the evening’s headliners on the Main stage. Or they could go on a mission to catch full or partial sets from the 24 or so artists playing across six stages positioned throughout the Orange County Fairgrounds in Costa Mesa. For the bold music lover, the second annual OCNYE provided its share of thrills and disappointments. But, then, isn’t that the joy of attending a music festival? Indeed, those only catching the action on the main stage missed the best performances of the seven-hour event. Although Tommy Tutone (in a mostly acoustic showcase, with the “867-5309/Jenny” singer-guitarist accompanied only by a drummer) disappointed in the first 10 minutes of his set, a short walk to a nearby stage rewarded with an amazing full-blown performance by the Knack. Yes, the Knack. Despite the death of the band’s original drummer, Bruce Gary, earlier in 2006, the Knack soared across the last 35 minutes of its set. Singer-guitarist Doug Fieger, who underwent surgery for the removal of two brain tumors only five months ago, led the group in a set that worked the audience near the stage into a festive frenzy. Performances of their best-known songs (“Good Girls Don’t” and “My Sharona”) were not the only tunes that got the crowd moving. A medley that began with a cover of the Champs’ “Tequila” morphed into a strong mostly-faithful take on the Doors’ “Break on Through (To the Other Side)” that may well have been the single-strongest performance of the night. The other standout appearance of the night went to Soul Asylum, whose versions of hits such as “Black Gold” and “Without a Trace,” as well as strong new material like “Crazy Mixed Up World” cast frontman Dave Pirner and his Midwestern band mates in an especially good light this night. Other performances, including from headliners Blondie and Violent Femmes, were of a decidedly by-the-numbers variety. Blondie delivered a wide-ranging set featuring its genre-defying material including reggae (“The Tide Is High”), punk-tinged new wave (“One Way or Another”) and early rap (“Rapture”). Violent Femmes scored best with the one-two punch of “Blister in the Sun” and “Kiss Off” early in their set. I enjoyed the Romantics while they were performing, although I sadly had to run before they undoubtedly got to their biggest hits, notably "What I Like About You." Uneven performances from the Tubes (“She’s a Beauty” didn’t fly), Buckcherry (even hard rockers should listen to each other when they are on stage together) and Everclear (singer Art Alexakis’ voice was hoarse and painful to listen to) didn’t mar the night. After all, with six stages to choose from and an endless number of watering holes positioned around OCNYE, there were plenty of reasons to celebrate.